I have one last Project Spectrum April photo for you. 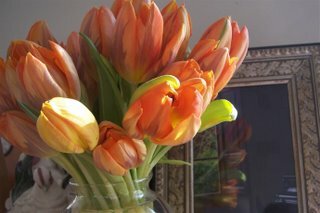 These are birthday tulips from the gang at the bookstore. Oh, aren’t they beautiful! I’m excited about the possibilities for Project Spectrum’s May color — green — because it’s not a color I knit with very often, but I’m drawn to all its variations and endless possibilities. Of course I know this stitch. It’s the same one I used for the scarf I made in 2002 with the same Brooks Farm Primero in that lovely soft blue and lavender colorway! The yarn that was the cause of my renewed obsession with knitting! 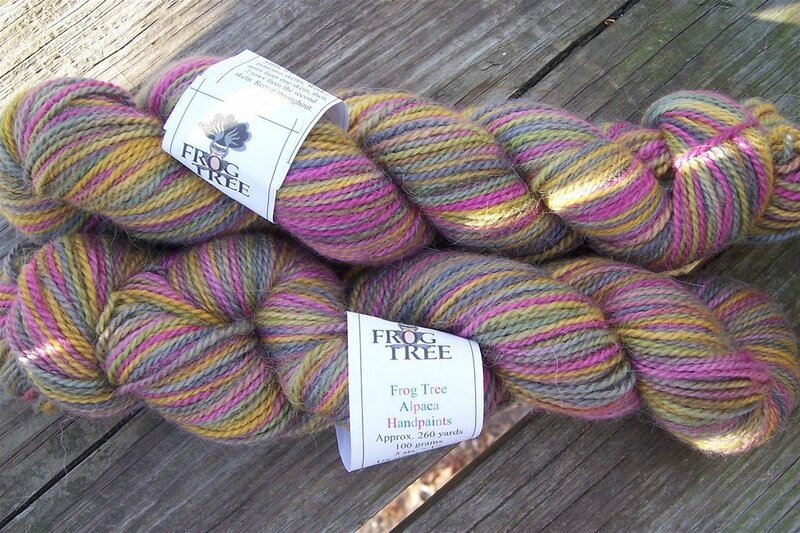 The only yarn I purchased at Rhinebeck that year! 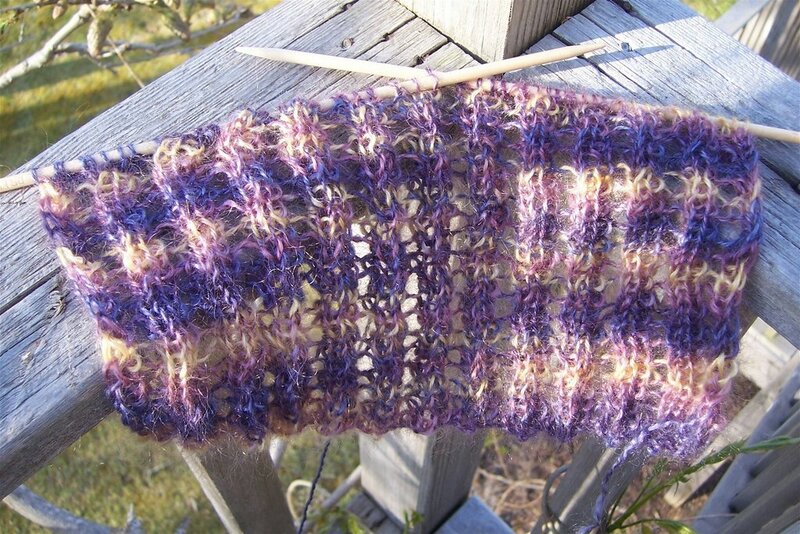 For that first scarf I used smaller needles — probably 3.75mm — because the fabric is denser. I’d know for sure if I’d kept any sort of records, but that would have meant I was admitting I was obsessed. Not me, no, not at all. The truth is that the trip to Rhinebeck in 2002, and the purchase of that yarn and the little bit of fiber that came home too (it finally became this scarf in 2005) was the best thing that had happened to me in a long, long time. So I suppose it’s fine that I’m knitting the same stitch in the same yarn. It’s just one more step in my journey out from the center. After a delicious birthday dinner, a cake with yellow flowers on it, the tulips, more tulips, presents galore, friends, and more laughter than I thought possible (wait, that’s not true, those screams and hoots are normal for us!) my birthday week is over. It was sweet and fun, and I think I’ll do it again next year! I had one more special birthday treat. My mom left a message for me yesterday, sounding a little upset. It wasn’t the case, though. She wanted to wish me a happy birthday. This is momentous on several levels: 1) she remembered; 2) she managed to make the call; and 3) it turns out that she’d orchestrated a complicated flower delivery (more lovely tulips) that apparently involved my nephew B because my sister S wasn’t at home at the time (at least I think that’s what happened). No matter. I’m touched, and so grateful for my little mother. Happy Birthday!! Sounds like you had a perfect day. Your frog tree is GORGEOUS! Another happy birthday wish to keep the sweet fragrance of birthday joy a moment longer. What beautiful birthday yarn too. And how sweet to get that call from your mother. sweetest of all, no? But sweetie – next year it is TheBirthdayMonth!!!!! Happy Belated Birthday Dear Jane. 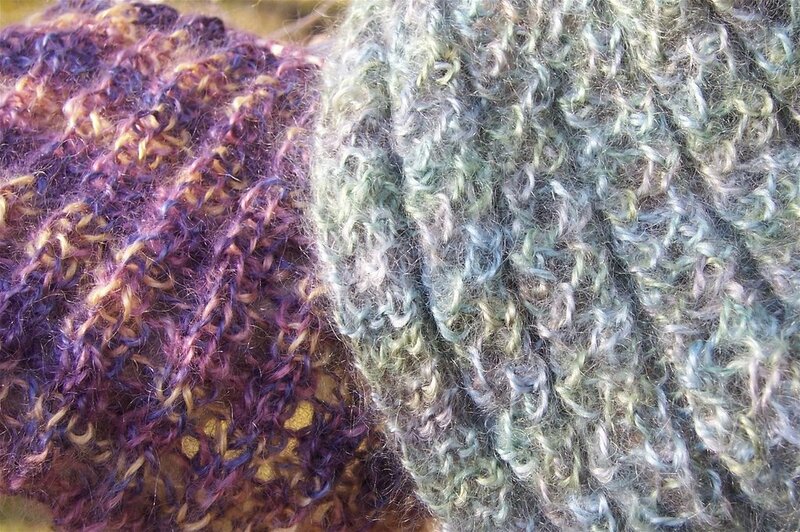 =o) What a lovely day!I love that soft looking mohair yarn scarf you are making.